#Fringebuzz Live Auction results and launch of the Online Auction! We would like to thank you for supporting the Fringe at our auction this weekend! We made a record $4,500! The online auction starts today and ends on April 30. Click here to see all the new exciting prizes! https://montrealfringe.ca/wp-content/uploads/header-trans1920-1030x278.png 0 0 Sarah Grenier-Laforce https://montrealfringe.ca/wp-content/uploads/header-trans1920-1030x278.png Sarah Grenier-Laforce2018-04-18 16:46:432018-04-18 18:06:36#Fringebuzz Live Auction results and launch of the Online Auction! To celebrate 28 years of FringeMTL, we are putting 28 Carte Blanche passes on sale. Unlimited tickets means limitless savings… But only for a limited time! Pre-order your Carte Blanche today and make a great deal even better… while supplies last! 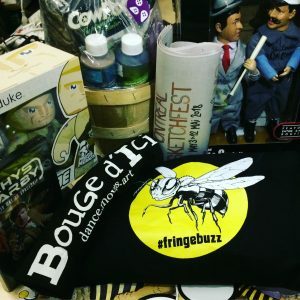 Sweet holiday deals on Fringe swag! Surprise your favourite Fringe this holiday season. Visit montrealfringe.ca/holiday-sale to take advantage of some sweet deals on Fringe swag! https://montrealfringe.ca/wp-content/uploads/header-trans1920-1030x278.png 0 0 Geoff Agombar https://montrealfringe.ca/wp-content/uploads/header-trans1920-1030x278.png Geoff Agombar2017-12-05 21:34:592017-12-05 21:34:59Sweet holiday deals on Fringe swag! Congratulations to our Early Bird 2018 winners! These companies are automatically accepted in the next edition of the Festival St-Ambroise FRINGE de Montréal coming June 2018! We received a record number of applications this year and to celebrate we’ve decided to select one extra company per category! Please see below for a complete list of successful early birds. If your company did not win, you have been entered into the lottery which will take place on November 11 at 8PM at the MainLine Gallery (3905 St-Laurent). https://montrealfringe.ca/wp-content/uploads/header-trans1920-1030x278.png 0 0 Amy Blackmore https://montrealfringe.ca/wp-content/uploads/header-trans1920-1030x278.png Amy Blackmore2017-08-30 16:30:052017-08-31 16:07:57Early Bird Application Results! 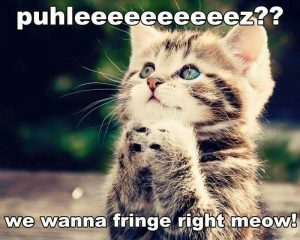 FRINGE applications will open on Wednesday, August 23 at 12PM EST, online at www.montrealfringe.ca. Be among the first 8 local French or English, or the first 6 Canadian or International to get a guaranteed spot!